Compare prices from several car hire companies in Tenerife Airport South and find the best price for car rental. Our prices always include unlimited mileage and insurance. 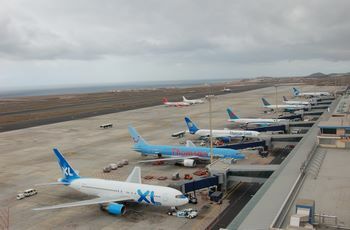 Tenerife South Airport (TFS) is one of two international airports on Tenerife. The airport is located approx. 60 km south of the island’s capital Santa Cruz de Tenerife, and you get there by following the TF-1 that passes near the airport. This stretch takes about 45 minutes, and the airport is providing buses, taxis and rental cars. Each year, employs about 9 million passengers in the airport, which makes Tenerife South Airport the biggest airport in the Canary Islands. Airlines that live here include EasyJet, Finnair and Air Europe, offering flights to many parts of Europe, Moscow, London and Amsterdam. Hotel Ucanca is one of several hotels that are nearby, and at the airport, there are tax-free, kiosks, restaurants and ATMs.